In this article I share 5 lessons that I learned from working with many companies on intuitive marketing. This is a new way of marketing where you don’t only use rational methods, but include your intuition and intuitive methods. As a management & organization scholar I have always been interested in what makes a business successful. Success for me is more than making a lot of money or optimizing profits. Success includes being healthy, happy, having fulfilling relationships and contributing to the world. Marketing is the key to becoming successful with your business. I have learned a lot about (internet) marketing and have coached many companies to improve their marketing and sales. During more than 10 years of consulting I have found out that there is more to marketing than we can learn from the theories and gurus. For some reason there are companies that have success without following these theories and others fail while doing exactly what the gurus and theories say. There is another force at work that creates failure and success. I call this the intuitive layer or intuitive force. 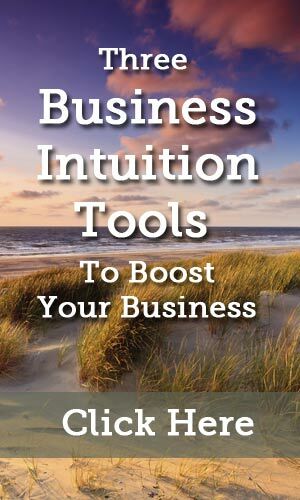 In the past 8 years I have been working with several powerful intuitive methods to really help companies improve their marketing and reach their goals. These methods have taught me five important lessons that I would like to share with you. The problem with all the theories and tips from gurus is that they assume that every company and every person is the same. They assume that what works for one company will work for the other. This is NOT true! How much I would like to offer you an easy way to success, what I have learned is that every company and every entrepreneur needs to find his own way to success. He needs to find his own unique marketing approach that works. First of all there are differences in products and services. Selling cars is something else than selling interim management services. Many marketing theories already differentiate between products and services. They even differentiate between different products and between different services. Another difference is the difference in size of the company. A large company has other resources to market its services than an independent consultant. This is already a point where marketing theories cannot provide adequate answers to the differences. There are theories for SMEs, but for me they are not suited enough to the special needs of small companies and self emplyed people. Finally there is also a difference in culture, energy and atmosphere between two companies and between people. I don’t know of any marketing theory that takes into account these soft differences between people and companies. What I have found out in all these years of coaching, training and consulting is that these differences really matter. For one company, for example, it can be really successful to advertise on social media, while for a similar company in the same industry this might not work, although they follow the same guidelines. Another example is an independent coach who gets all his clients through word of mouth, while another coach will be successful by visiting many network meetings. The important lesson I have learned is that you should find your own successful marketing approach. Use all the theories, tips and success stories as inspiration, but let it resonate within you. Then decide what approach you and your company will follow. This requires being connected with your intuition and have released anxieties and fears. Otherwise these will influence the process of finding the marketing approach that fits you. Selling your or your companies products and services is not a sterile and objective process. It involves people, emotions, history and luck. I have found out that being connected has a huge impact on the success of this process. Connection with oneself: First of all you should be connected with yourself. You should really be true to yourself and what you stand for. You should be aligned with your inner values and goals. It is not about playing a role or using a mask. It is all about being your authentic and natural self. Connection with your company: You should also be connected with your company or the company you work for. Can you really feel that you belong there? Can you feel the connection with the company you have created? Can you feel that the company is needed in order to sell your products or services? By connecting with your company (or the company you work for), you create more power and energy to sell. Connection with your service or product: If you sell something that you don’t really believe in, it is not going to work. You should really feel connected to the product or service you are selling and even beyond that to the impact this product or service will have in the world. Can you sense the effect of your product or service? How will your client change and his clients? Maybe it is strange to say, but I think you should feel love for that what you have to offer. Connection with your client: Last but not least, there should be a connection with your (potential) client. Can you feel the connection between you and your potential client? Do you respect your client and be thankful for him to be your client? Clients or customers are fueling your company. They are the most important factor in the success of your company. By connecting with your clients you will be able to sense what is needed to sell your services or products. By being thankful and respectful you will radiate an energy of positivity and this will attract clients. Again, if you are really connected it might feel as love for your (potential) clients. Whenever you sense that one of these connections is not very strong, your marketing approach should be to re-establish this connection. There are many ways of doing this ranging from talking to your customers to visualizing your connection with your service and from having a talk with your employer to meditating and being honest about your own feelings related to your business. What I have seen in business constellations (read more about business constellations here) time after time is that the root cause of not getting enough clients is found in something totally unexpected. One company, for example, wanted to get more clients in their home town. For some reason the majority of clients came from out of town. This meant much more traveling and they didn’t want that anymore. We used a business constellation to find out the root cause of this problem. It turned out that the former owner of the company’s building committed suicide inside the building. The local people subconsciously didn’t want to become clients because of this event. After the entrepreneur could acknowledge this event and honor this former owner, the clients felt more attracted to the company. This example and others show that our rational mind cannot always grasp the vastness of possible influences. From the systemic approach used in business constellations we have learned that problems we come across in our daily (business) lives, are merely symptoms of something deeper. There is something in the larger system that is causing this. The cause and effect relations that we are used to and have learned in school are not always true. There are more interrelationships than we can see at first hand. Using a systemic approach, your intuition or business constellations you can learn what is really causing the problem that you face. This way you can also take the necessary actions to change this once and for all. This lesson is a strange lesson, but I really want to share it with you. In schools and also in businesses we know of people that don’t start a project or don’t do marketing because they are scared of failure. They don’t want their actions to result in something bad and that is why they don’t even start it. This is of course a big show stopper and doesn’t help you. What I have seen in many workshops I have given about intuition and marketing is that people can also be afraid of success. Subconsciously they are stalling, finding diversions or reasons not to do what they know they should do. When you look into this, it turns out that these entrepreneurs and managers are scared of success. This might be a cultural issue, since the general culture in the Netherlands is not to stand out. We have this saying “Act normal, that is already crazy enough”. It might also be true that in more cultures the fear of success is stopping you from getting more clients and creating a flourishing business. Like everything I write, check if this applies to you and your business. Do you recognize that it is difficult to start marketing actions because you fear they will fail? Or that you fear that they will lead to success? The only thing I ask you is to be honest and true to yourself. What you could do is the following exercise. Imagine that your actions will lead to success. You get all the clients you want. They are happy with you and your company. You deliver up to par and are really happy with doing so. You have a lot of energy and creativity. Now focus on your body, your emotions and your thoughts. What happens when you really connect with this success? Let go of everything you experience. Just breath it out or use another release technique. Now imagine that nothing works out. You don’t get new clients, or even worse, clients find other suppliers. You try everything but nothing works. You run out of money, energy and creativity. The clients you have are dissatisfied and require a lot of negative attention. Again, focus on your body, your emotions and thoughts. What happens when you really connect with failure? Let go of all these sensations. This way you create a neutral ground inside yourself from which you can take the necessary steps without being afraid or wanting too much. This inner stance opens up your intuition and makes it easier to decide intuitively what the next marketing action should be. It also helps you to release the blockages that prevented you from taking the necessary actions. In the Western world we are really focused on doing, actions and results. We have this scientific idea of cause and effect. We think we need to do something to cause something else to happen. If you apply this to marketing we need to take marketing actions in order to get new clients. In the workshops and coaching about marketing that I have given, I see quite often that the important next step or next action someone needs to take is: doing nothing; relaxing; taking a step back; just being. In our action-world this is a very strange step and it requires a lot of will power, inner power and trust to take this non-action. One way I found out that doing nothing is also an option was through the Human Design system. The Human Design System is a synthesis of ancient and modern sciences, and has proven to be a valuable tool for human understanding. It offers insight into your psychology and helps you to make decisions and take the actions that fit your design. One of the things I have learned from Human Design about marketing is that the best way for me to do marketing is to play hard to get. This means that I share my insights, but I don’t push people to become my client. Instead of following all these marketing tips of creating an offer, creating scarcity and repeating my offer, I just lay back a little. Whenever I am really connected with the things I do, people will automatically find me and want my services. Clients of mine have found out through the Human Design System that they need to wait for the request. They need to wait for someone to ask them to offer a service. That is the complete opposite of what marketing books tell you, but for this type of people it works. Another client of mine told me that whenever she wants new clients, she sits and meditates. She visualizes new clients coming into her office. Most of the time that afternoon she gets a call from a new client. This requires to know yourself. What is your unique way of doing business and finding clients? What are your pitfalls and patterns when it comes to marketing and finding clients and what can you do to overcome them and be more aligned with your inner strength? This again requires letting go. Letting go of ideas, pressure from others and letting go of trying to do your best. If you sense that this approach to marketing really suits you, you might be interested in learning more about intuitive marketing. A great possibility is to follow the workshop The Intuitive Marketer in which Ken Homer and I have chosen some powerful intuitive methods and techniques to help you find out your unique way of doing marketing. You will also be able to let go of some old patterns and beliefs that are not helping you. We will give this workshop in Oakland, CA on May 23rd. Sign up now and get a 50$ discount with the discount code MMIM. Thanks for your interest in this marketing approach, Julia. Unfortunately I don’t know of anyone in your area that approaches marketing this way. There are not many, at least not in the Netherlands. I have an online training in Dutch in which you learn more about intuitive marketing. Your question is a trigger for me to start translating this course in English. But it is not ready yet. Some of the principles in intuitive marketing come from the systemic work based on constellations. You can read about this in for example the book “Unlocking Systemic Wisdom” written by Siets Bakker and Leanne Steegh, or “Systemic Coaching” by Jan Jacob Stam. Other parts come from a non dualistic view of the world. Thirdly intuititive marketing is based on energy reading and energy work. Maybe you can google this and find more information about these topics.